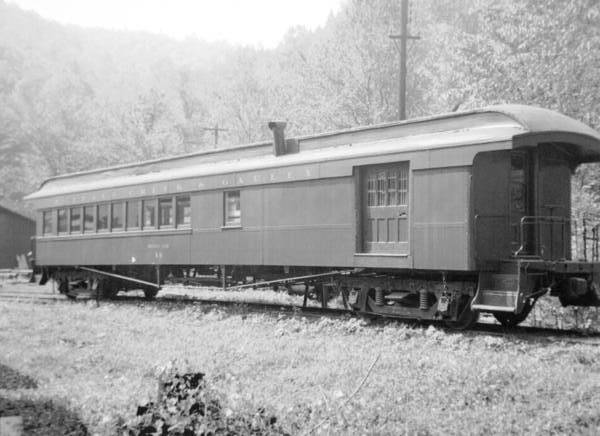 Information is sketchy about the early passenger cars of the BC&G. While the highest numbered one was #17, there is no evidence that cars were numbered sequentially or that there were a total of 17 different cars over time. I've listed them in the order of their apparent age. 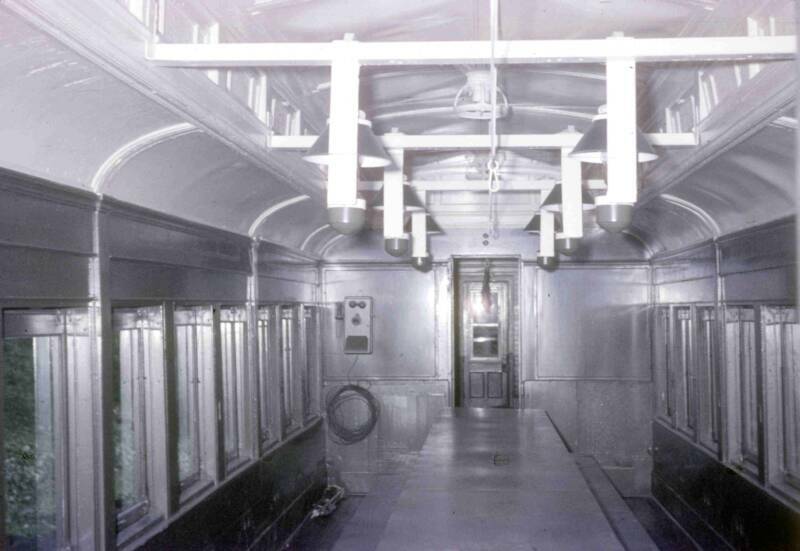 It should also be noted that these passenger cars served as cabooses up until the arrival of C-1 in 1959. More than one source makes reference to the fact that when the BC&G acquired its first locomotive from the B&O (then Coal & Coke) that they "threw in" two coaches with the deal. If true, it's possible that those two coaches are the ones in the photo to the left with BC&G 4-4-0 #1. The coach most visible has the same number of windows and a door in the same spot as Combine #13 below. BC&G #X-6 "Dining Car" has to the most interesting of all the passenger cars. In the 1950's this car was numbered X-6, the 'X' designation suggesting it was a MOW car. However, it says 'Dining Car" on the side above the number. 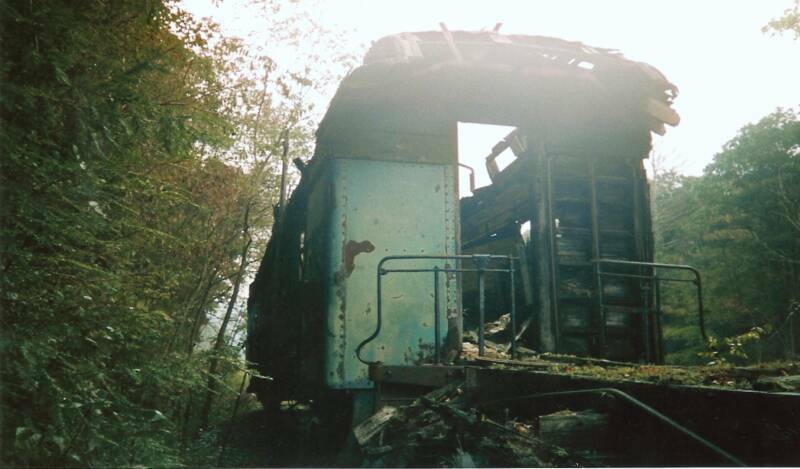 This admittedly low quality image is in my collection but I do not know where it came from other than it was in a small group of photos from a railfan trip. It looks like X-6 is being used here to provide a meal for some happy fan trip participants! Most references simply stated that coaches #16 and #17 were "ex-PRR units." But now, thanks to Fred Freitas and George Pierson, both PRR experts, much more can be said! According to Fred, "these cars are remants of the war years and Pennsy's efforts to use anything to refit for passenger traffic. 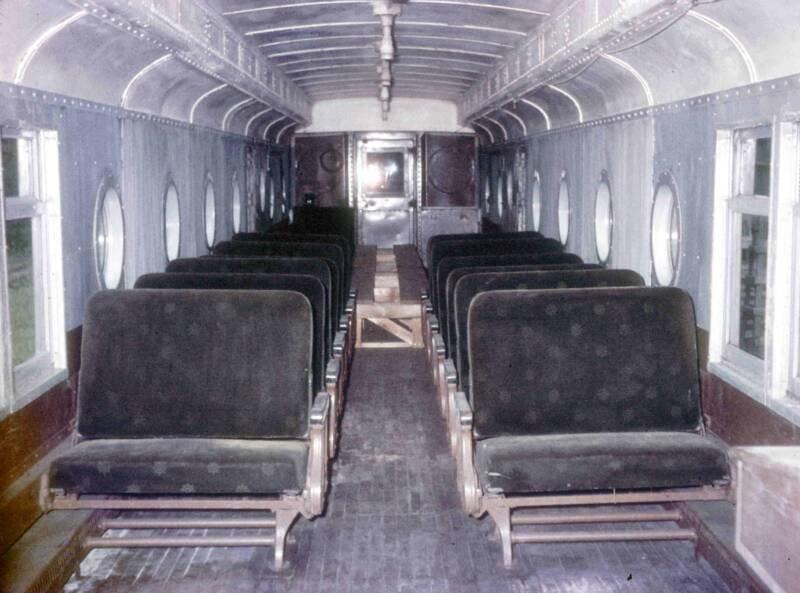 The baggage/rpo's with portholes were cobbled in the Altoona shops to make seating available. They were used mostly for commuter and some military base worker transport. This freed up better equipment for long distance trains. Some of these cars saw duty as troop transports in 1944." George provided the additional detail below found in the Summer 2001 edition of The Keystone, a publication of the PRR Historical Society, I believe. BC&G X-6, #16, and #17 were painted olive green, the same color as the rail buses. These seats appear to be the ones installed by the PRR. Specifically, #16 was one of 5 PRR Class PS92 (#6977) built originally in 1916 as a MPB M54 (#5255) combine and converted to a PS92 coach in November 1942. Four portholes were installed in each side of the car in the baggage and RPO sections. Green "plush-covered" wood benches were installed increasing the total capacity of the car to 92. 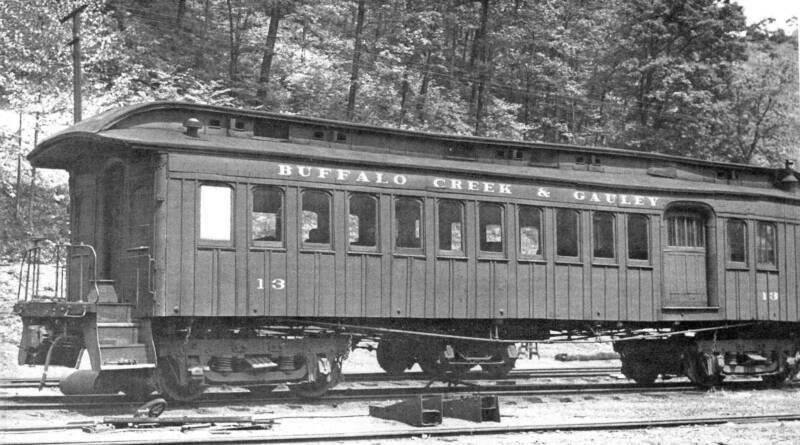 Whether the iced water cooler installed or the "dry hopper" commode installed by the PRR were in place on the BC&G is unknown. The PR92 class was withdrawn from PRR service in 1946 although #6977 was still in local service in Pittsburgh in Januray of 1947. Originally offered for sale for $3,800, it was sold to the BC&G on May 21, 1949 for $1,500. The other four PR92's were dismantled in 1949. 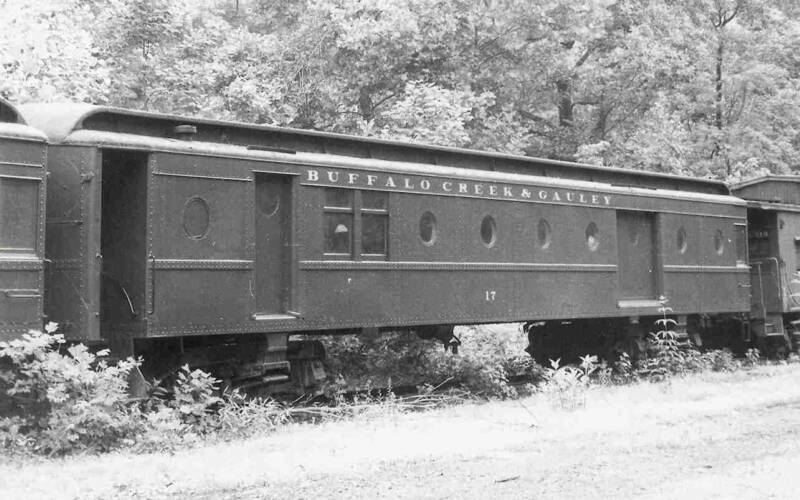 Similarly, the Keystone article reports that #17 was one of eight cars originally built in 1914 or 1916 as class MBM62 and converted to a class PS72 in December 1942. It was #5493 as a MBM62 and became #6969 as a PS72. 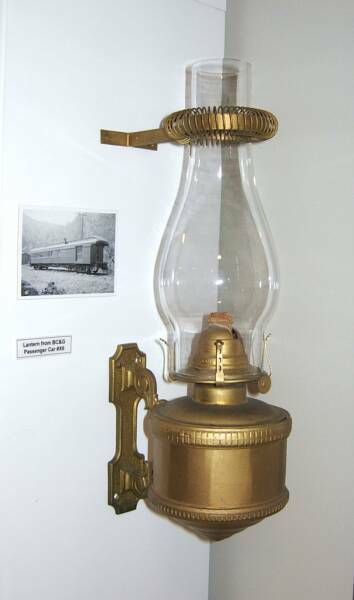 Seven port holes were added at Altoona to provide interior light. In early 1946 this class was withdrawn from regular service and offered for sale at $5,200 each. 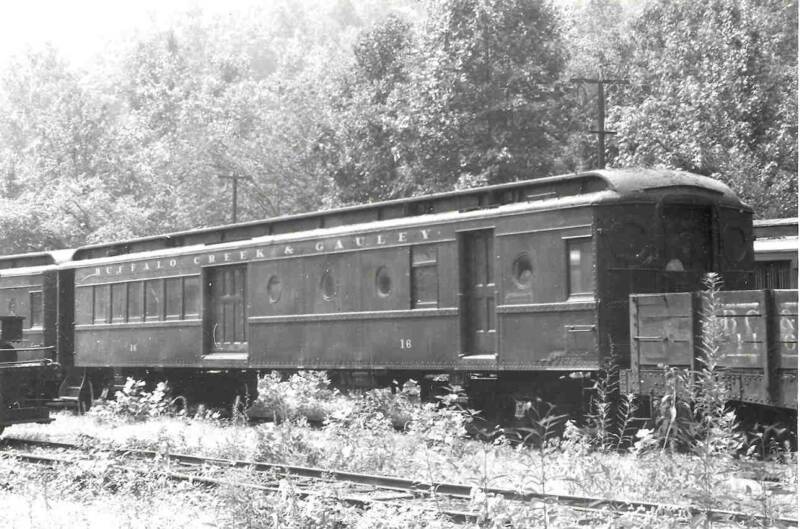 #6969 was sold to the BC&G on 5/21/49 for $1,500. 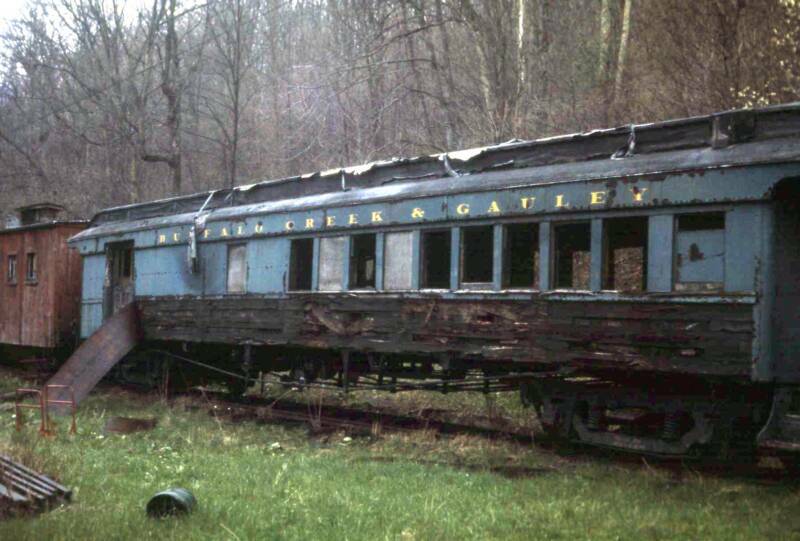 Two cars were reconverted to baggage cars and the remaining were dismantled in April of 1949. 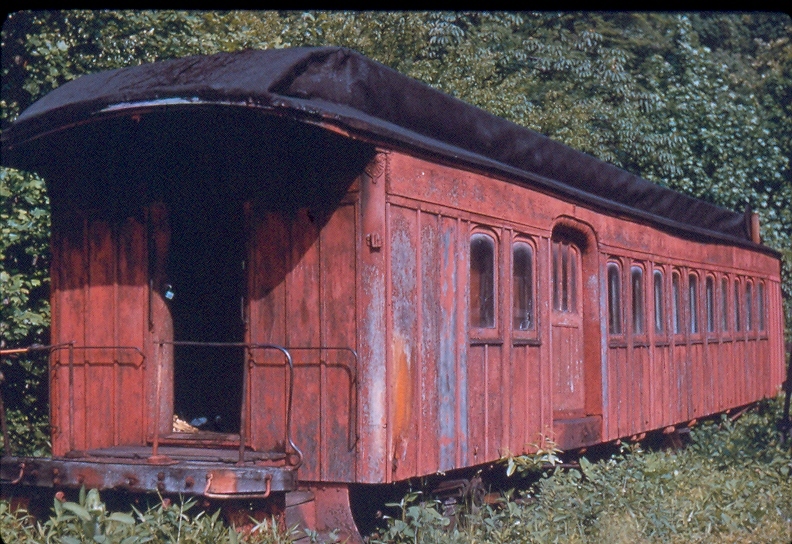 So, the bottom line on these two coaches is that they are the only two of 13 baggage/RPO/combines converted by the PRR in this manner to have been sold to another railroad and the BC&G managed to buy them at signifcantly less than their original "asking price". One thing that is interesting is that the capacity of these cars far exceeds whatever would have been needed by the BC&G for passengers. They must have been purchased on price! Editors note: I had assumed prior to receiving the definitive information from George Pierson about the 1949 sale that these cars had been acquired by the BC&G earlier than 1949. 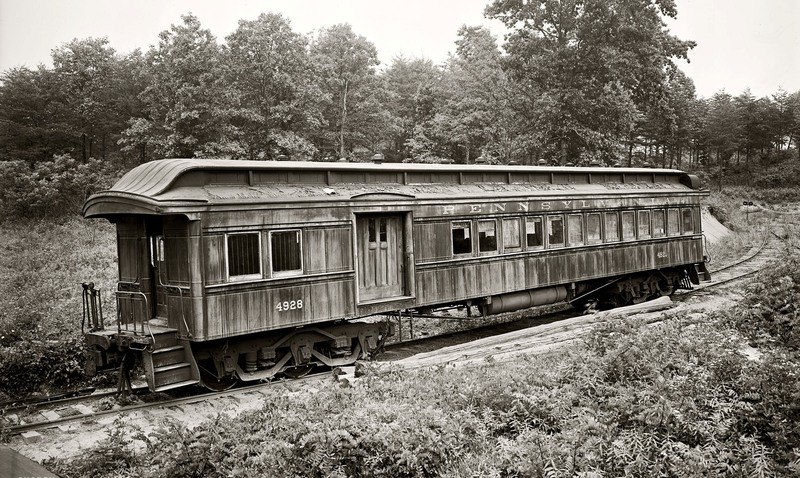 According to the Official Railway Equipment Register, there were three passenger cars on the roster in the years before 1949, so there must have been others before #16 and #17. 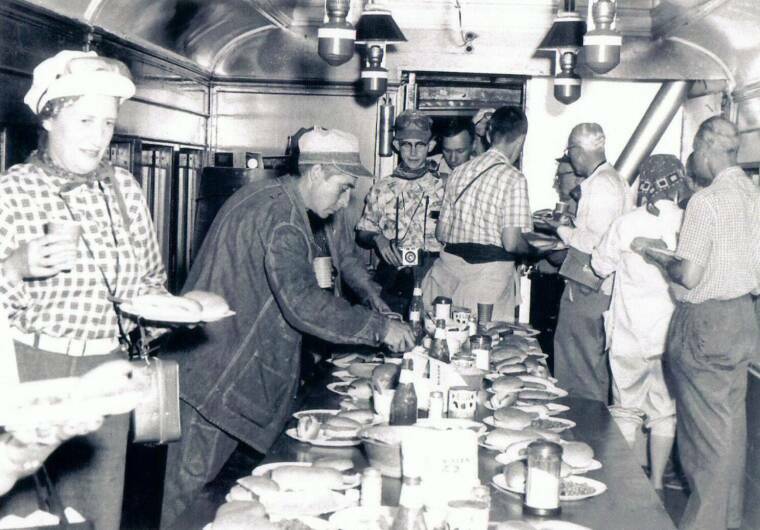 Before 1949, perhaps dining car X-6 was configured for passenger service before the arrival of #16 and #17 and served with #13 in passenger / caboose service until #13 was retired. 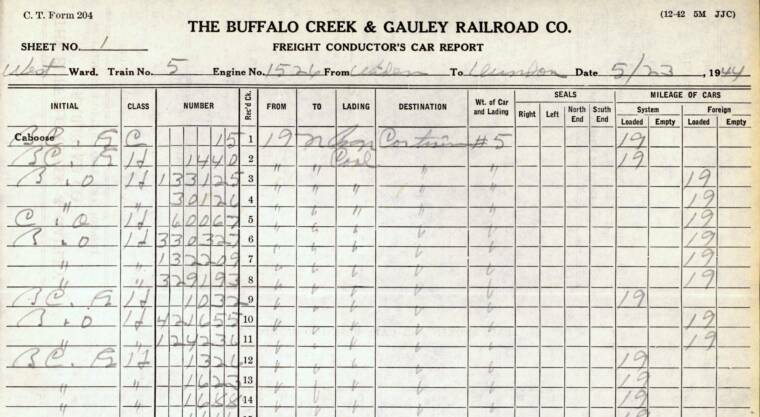 There is still no accounting for a #14 or #15 other than the 1944 Conductors Orders (above) showing a caboose #15.. 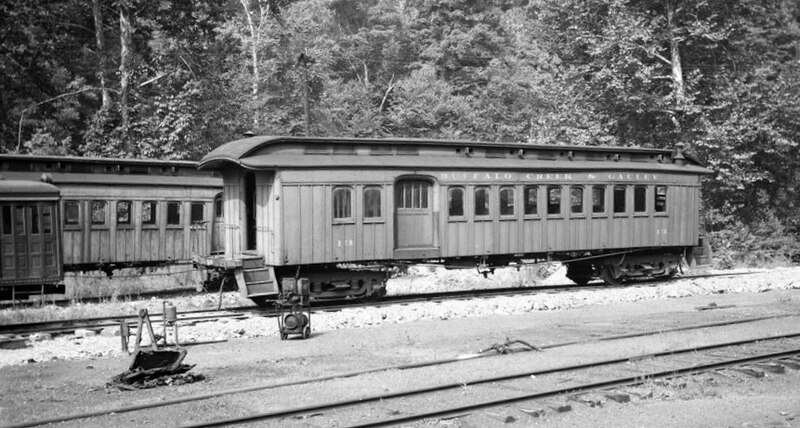 These cars were used as cabooses on the BC&G, as well as for transporting passengers, so there might have been a conductor's desk installed in them, although I've seen no photos to confirm this. This undated photo was taken at Widen. 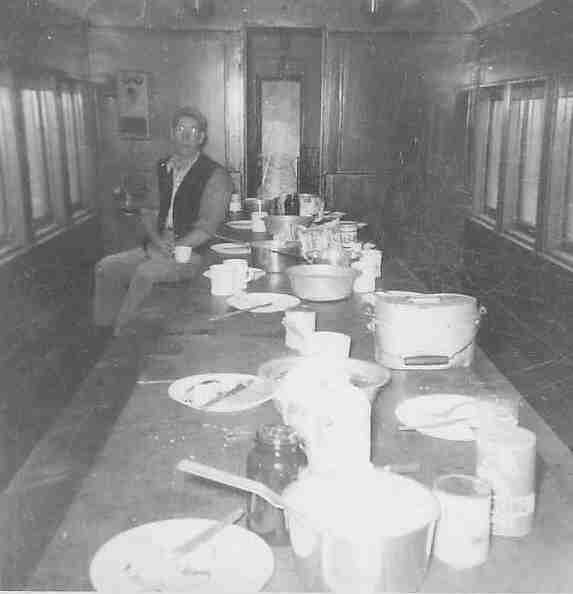 If it was taken after the combine was converted to "Dining Car X-6" was it a very short work train? If it was taken before the conversion, was the combine being used as a caboose or was it one of the depression-era passenger-only trains, short as it may be?. 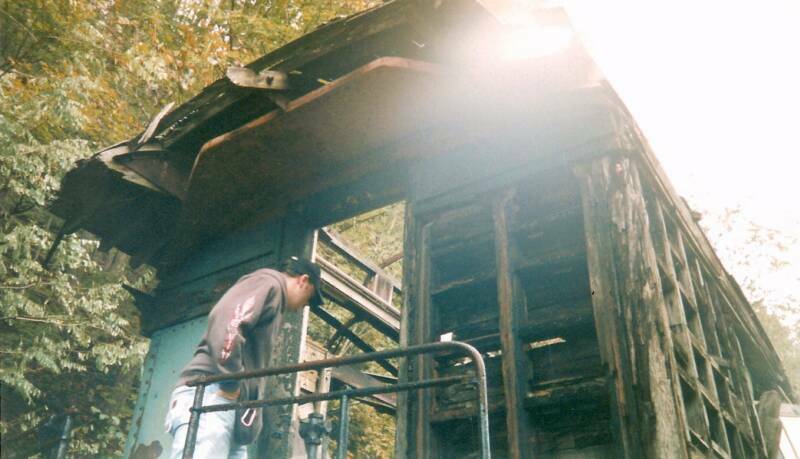 Both coaches #16 and #17 wound up at the Cass Scenic Railway in Cass, West Virginia. As far as I know they were never used in revenue service and were eventually dismantled at Cass. Perhaps someone can provide a photo of them there. Cody Burdette worked at Cass for a while and reports he saw the coaches there in 1980 but they were in "really bad shape". Cody goes on to say that he "needed some metal of the right gage to make up the front trucks for his live steamer and he got it out of one of the coaches." So Cody's live steamer has a little bit of the BC&G in it! Tony Eagle, a BC&G fan, provided the photos below of X-6 at Cass in its final days. 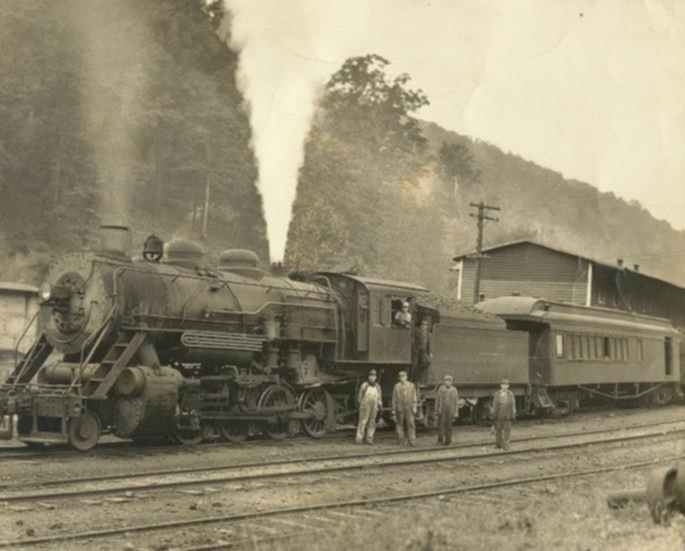 According to The Log Train (Issue 53) in an article entitled "Cass Scenic Railroad All-time Roster", X-6 was donated by the Pittston Coal Company in 1967 in good condition. Having lost its roof, deterioration took place quickly. Bob Slavy has provided this photo of BC&G X-6 abandoned at Cass. The date is around 1975. 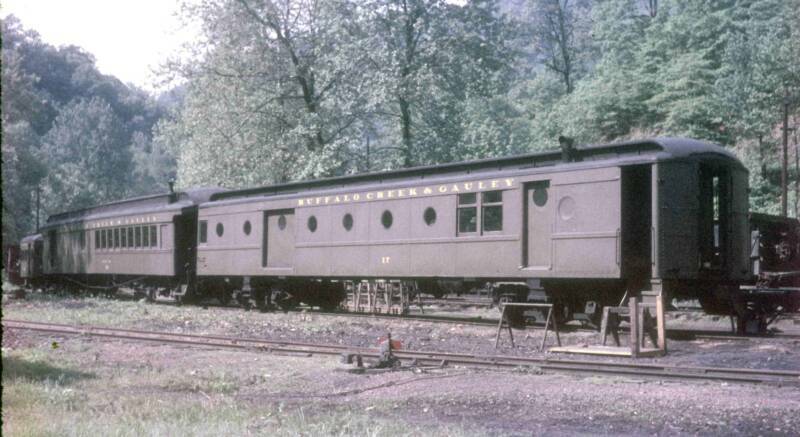 According to the Cass Scenic Railway All-Time Roster, BC&G's X-6 was a 60 foot steel-sheathed car built by Harlon & Hollingsworth (a division of Bethlehem Steel) of Wilmington, DE in the 1880's for the Philadelphia and Reading RR. The color photo above was provided by Bob Amon. It was taken in July 1962. It is a bit of speculation that this is the interior of car #16 but based on the window configuration and the fact that #X-6 had a table and kitchen, I believe this is a good assumption. 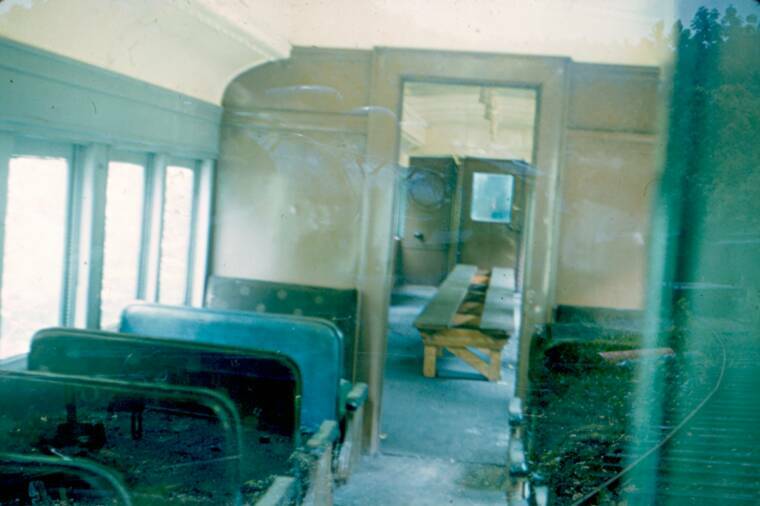 Notice that there are seats, perhaps the ones the PRR installed in part of the car and a crude center bench in the other section. To the right is a Freight Conductor's Report from May 23, 1944. The caboose (yellow arrow) is clearly listed as #15. The author has seen no other reference to a car or caboose #15 so any explanation is purely speculation. One possibility is that X-6 was previously numbered #15. 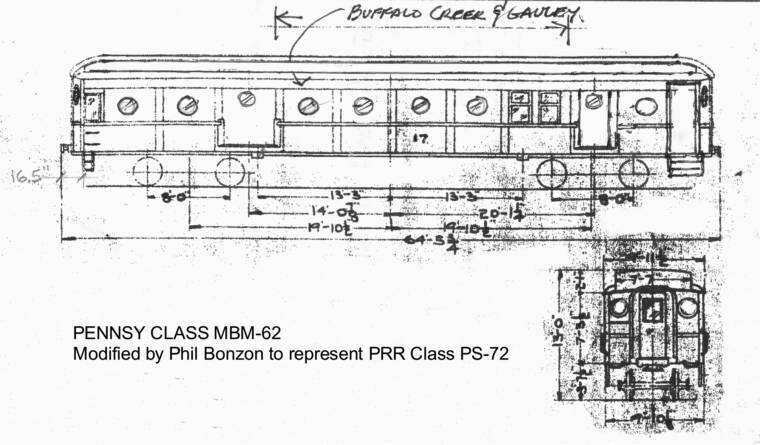 Phil Bonzon located this drawing of a PRR Class MBM-62 car, the type used to create #17. Phil has added the round windows that PRR added to convert the combine to a PS-72 passenger car, the form it was in when acquired by the BC&G. 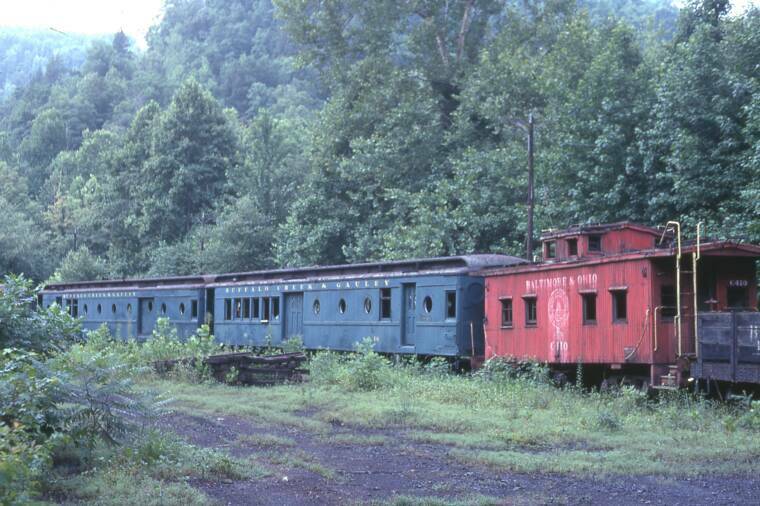 The photo on the right was taken by Richard Bradley in July 1969 after the railroad had been out of service for about 5 years. The weather, and perhaps vandals, have already taken quite a toll on the two cars. Whether the color has changed due to weathering, repainting, or simply differences in film and film-aging is not clear. 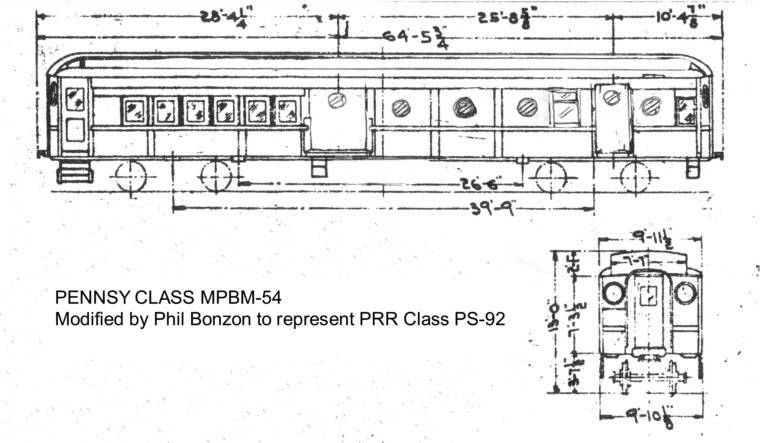 Phil Bonzon found these drawings of a PRR Class MPBM-54 combine and modified the drawing to show the car as it appeared as a PS-92 coach when it arrived at the BC&G with porthole windows added. William Sparkmon has provided this image that appeared on a postcard of BC&G #2 with a wooden coach. It's not possible to read any number on the car in the photo. The same car, also with engine #2, appears on page 4 of the Warden book and is dated 1928, although this photo is undated. 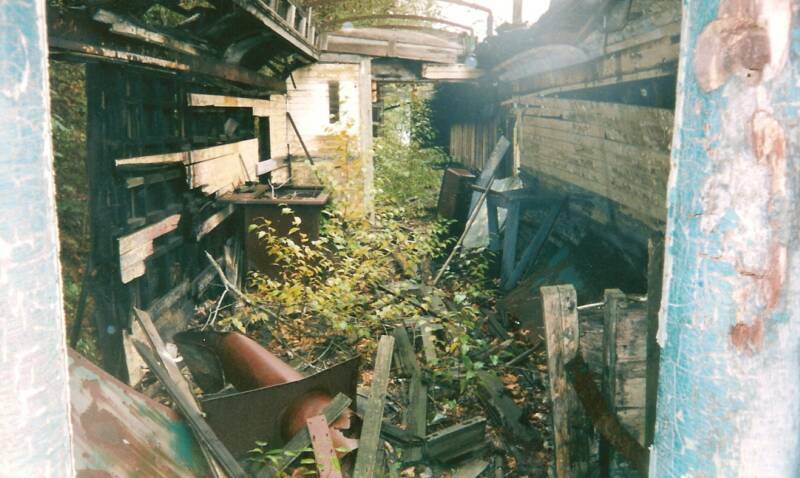 Given that this is a wood-sided car, it is presumed to be older than Dining Car X-6, below, which is steel-sheathed. The photo below right reportedly shows the car being used to feed crewmembers working on repairing the Sand Fork bridge in the mid-1950's, in MOW service. The interior was fitted with a long table running lengthwise in what was once the passenger section. 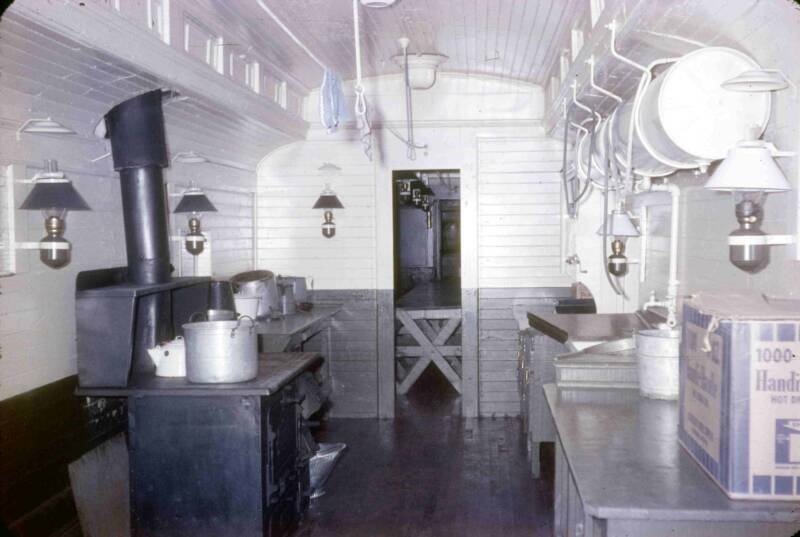 What was originally the baggage section was converted to a kitchen. The two photos on the left by David Marquis show that it was immaculately maintained up to the end. In fact, his two photos almost look like photos of a restored car! Who did the conversion to dining car and when it was done are not known. This excellent color portrait was taken in October 1961 by Doug Wingfiled of Alberta, Canada during one of his two visits to the BC&G. Fortunately, the two photos are of opposite ends of the car. is no lettering visible on the car in the background so it is possible it never was in service on the BC&G. George Pierson has provided this image from the Shorpy website of a Pennsylvania passenger and baggage combine of their Class OG. 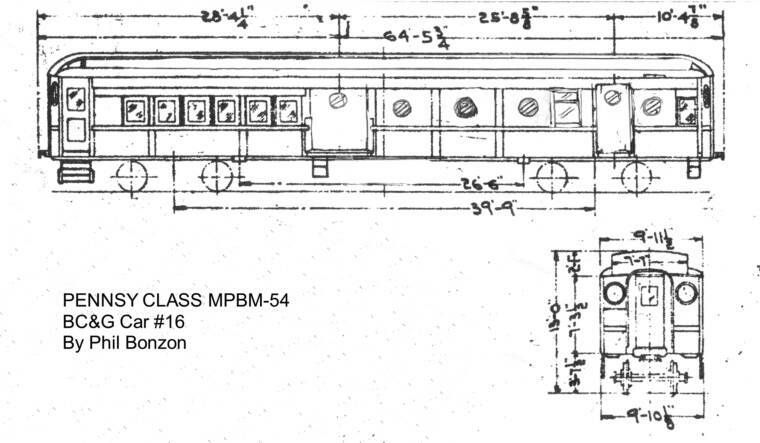 According to PRR documents from the collection of Bob Johnson the car rode on 3-axle trucks, was 66' 6" long and had a 19' baggage compartment and seated 48 people. George noticed that this car is of the same configuration as the one behind #2 in the photo above, suggesting the BC&G car came from the PRR. George further observes that it was not unusual for the ends of the roofs over the platforms to be reconfigured during the life of the car. Carlton "Bud" Rose,has been collecting information on the CNJ for nearly 50 years and has authored numerous articles on the subject. He has provided the following information which suggests that the two coaches came from the CNJ, not from the B&O as commonly suggested. 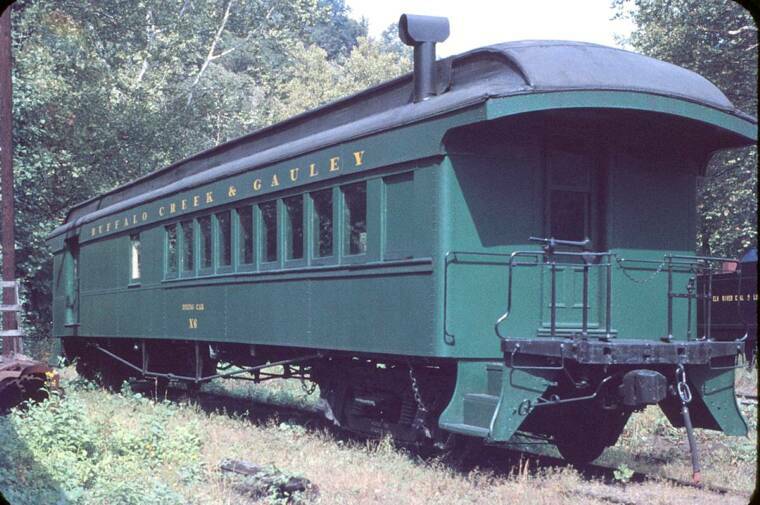 Car #2: built by the Wason Company in June 1881 as coach #409. 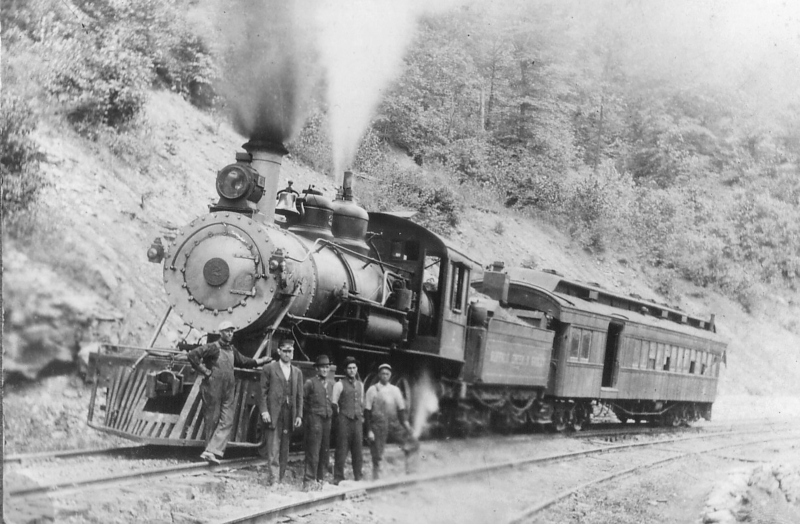 Again, around 1890 car was rebuilt and re#60 (same reason as above). In 1905 car once again re# to #1194 before securing its last no# 1164 in 1910. Car was sold to the BC&G in May 1922. According to CNJ records, cars had a body length of 48'0" and 48'6" respectively, with a length over sills of 56'3". No info provided regarding seating capacity. Unfortunately, Bud does not have any photos of either of these cars while in service on the CNJ nor does he know which no#'s they held on the BC&G but is confident #13 is one of them.